Please refer to our Admissions Policy document before completing your Registration Form online. 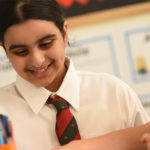 We are an inclusive school, but operate a selective admissions policy, based upon the identification of pupils whose abilities appear to match the ethos and standards of the School. We look for personal qualities which suggest a child has the potential to contribute sufficiently to the school community and benefit from the many opportunities that are offered at The Royal Grammar School, Guildford in Qatar. The language of instruction is English and all children are required to have a good understanding of the English language in order that they are fully able to benefit from all aspects of the curriculum. Once you have decided that The Royal Grammar School, Guildford in Qatar is the best choice for your child, the next step is to submit an application form to us. Please click here for the application forms.